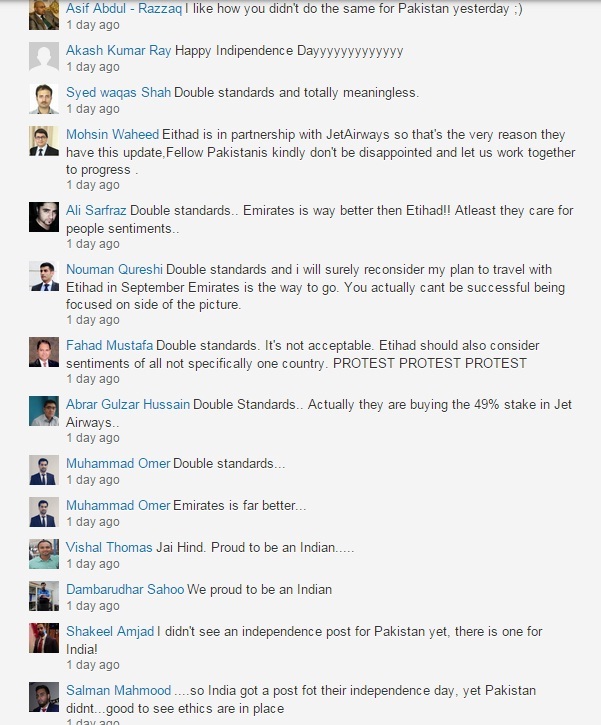 Last week Saudi’s social media space was alive with chatter and calls for a boycott. But this wasn’t for a global cause, a political issue, or a case of consumer activism. It wasn’t even about the color of a dress or the shenanigans of a Kardashian. Instead, it was about a Saudi national who tweeted a complaint about the drink he’d been served at a McDonalds restaurant and the rapidly escalating series of events which got him put in jail. I’m going to try to keep this story as simple as possible for factual reasons. A young Saudi national Abdulrahman bin Jumah was at a McDonalds outlet in Jeddah on the 19th of October and ordered a meal, which included a coke. Inside the cup, he claimed he found a cockroach. He then shared the image on social media to his followers (which I assume would have been less than the 3,216 followers he has now). As Abdulrahman deleted his Tweets, here’s an alleged image from another Saudi Twitter account who retweeted the Tweet. Abdulrahman tweeted his experience and contacted the local municipality online at their Twitter account @JeddahAmanah. The municipality took swift action and closed the branch in question the day after on the 20th. نشكر لكم تعاونكم، ونفيدكم بأنه تم التأكد من الشكوى وإغلاق مطعم ماكدونالدز. Simple enough? You’d think so (and restaurant closures are a fairly common occurrence in Saudi as you can see from this tweet announcing the closure of a KFC outlet in Jeddah. I cannot comment as to whether a restaurant closure would be common for McDonalds Saudi). After a day however (I’m assuming here the 21st), the branch reopened and Abdulrahman tweeted his thoughts on the issue, namely that he was surprised that the branch could open so soon, and that he wasn’t looking for compensation but rather an apology for the experience. Again, these are screen shots as the original tweets were deleted. And then arrested by the police. Defamation is a criminal rather than a civil offense in Saudi Arabia. 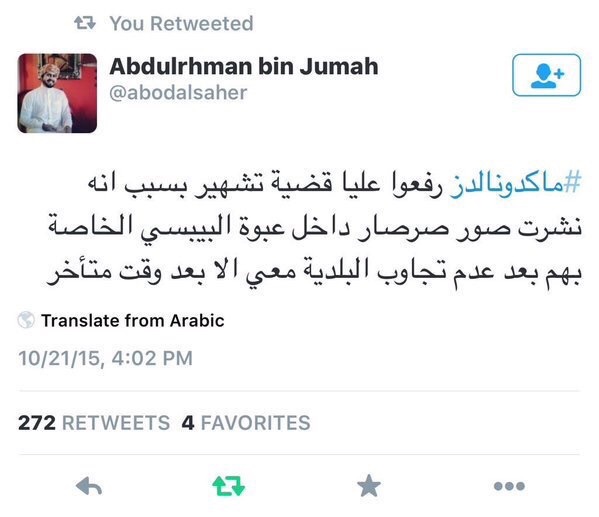 After the below tweet Abdulrahman’s timeline supposedly goes quiet. 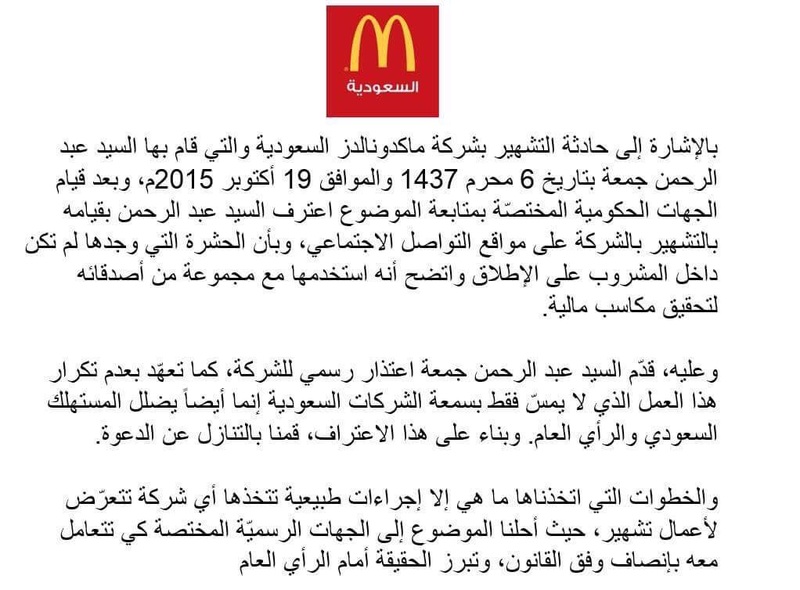 McDonalds Saudi also put out a statement online in response to many in Saudi who have come out to ask about the allegations or who have supported Abdulrahman stating that the case was caused by an intention to gain financially from the allegation that he’d made and that, following the apology, McDonalds Saudi had dropped the case. 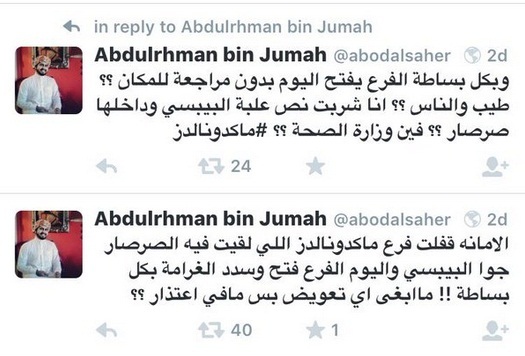 Abdulrahman deleted all of the story’s tweets, except those in which he makes an apology. Without knowing the facts in the case, it’s hard to know what really happened. Did Abdulrahman really find a cockroach in his drink or was it a case of extortion? 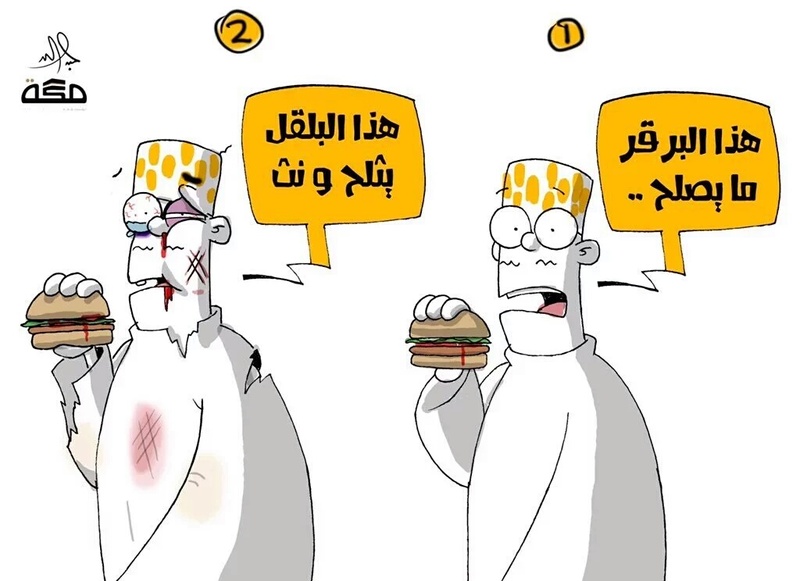 However, Saudis on Twitter have not been kind to McDonalds Saudi and their involvement of the police. 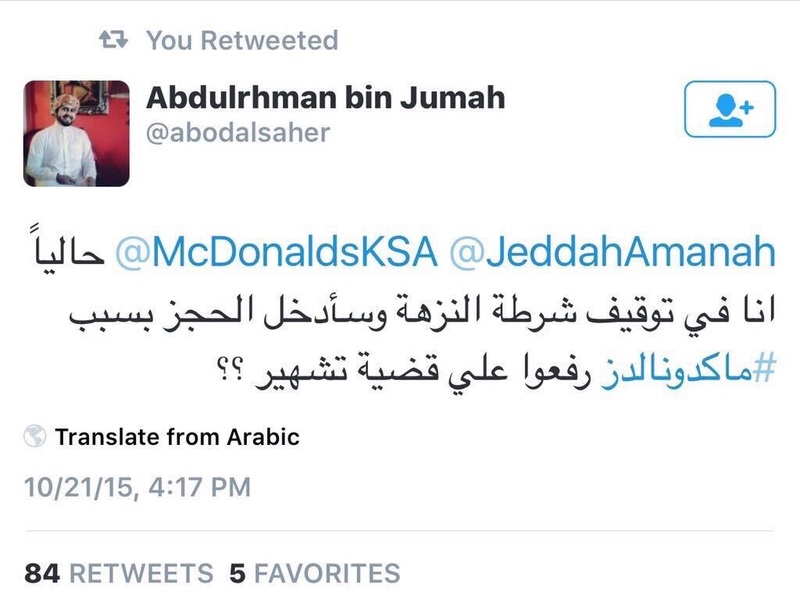 The hashtags used by Jumah are replete with angry responses to McDonalds Saudi. The case has also made the national media, albeit indirectly. 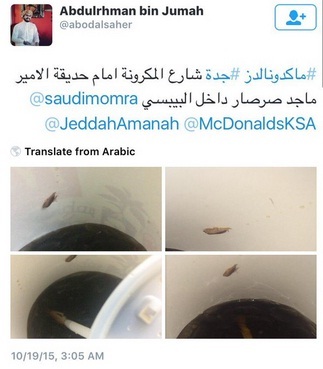 McDonalds Saudi certainly acted quickly in terms of responding to the crisis, but did they respond in the right way? Has the issue done more damage than it otherwise would have thanks to the actions of McDonalds Saudi, or were they right in involving the police when they did due to their belief that they were being blackmailed? What are your thoughts? What lessons can we take from this case? I’d love to hear from you. PS Saudi social media personality Omar Hussein has also talked about the issue. For you Arabic-language speakers out there you can see his Facebook video below. 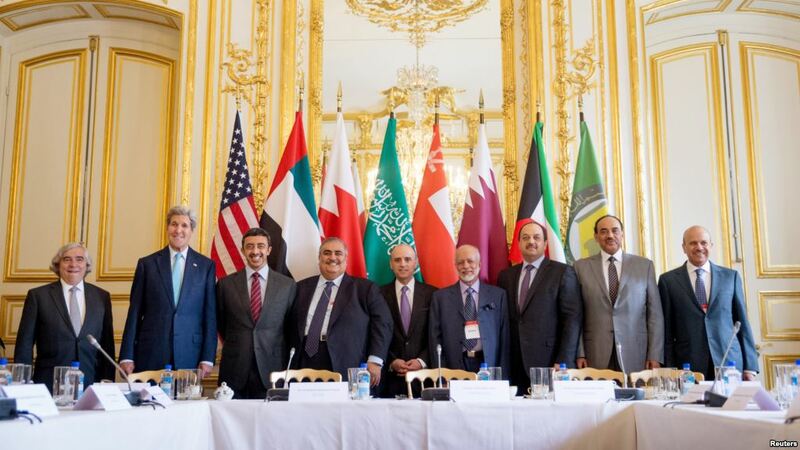 The Gulf’s foreign ministers have worked hard to change perceptions of the region abroad. But is there a simpler solution? Foreign media officials in the Gulf Cooperation Council (GCC) have stressed the need to formulate a common media strategy that will reflect the positive image of the six member countries abroad. The officials, who were holding a meeting in the Qatari capital Doha, reviewed plans and suggestions for future actions in their communication drive with the international community. “The participants discussed several issues related to the progress of their work, including a common strategy to rectify the distorted image that some Western media have about the countries in the region,” Ahmad Al Buainain, the head of the foreign media department at Qatar News Agency (QNA) said. “The meeting also discussed several papers and new ideas regarding the way forward for the GCC foreign media in European and Asian countries in order to convey the realities on the ground, he said, quoted by QNA. 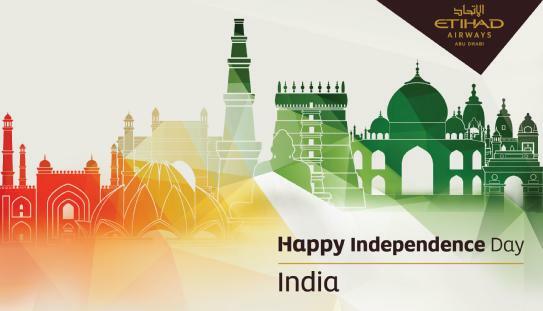 Plans include holding seminars and meetings with research centres or organizing events at international functions in Europe and in which the GCC countries are participating, he added. “This new drive is a continuation of the activities conducted by the foreign media officials at past events,” he said. Ahmed Mussa Al Dhabyan, the head of media cooperation at the GCC Secretariat General, said that the GCC foreign media officials sought to build on their successful experience and formulate a new strategy that matched the latest developments in the communication field. “The world has gone beyond the global village concept and has now become a single house,” he said. “The GCC has a significant political and economic weight and it has a special standing internationally, and therefore it needs to have a foreign media presence that matches its stature,” he said. Earlier this month, reports surfaced from Washington D.C. that Saudi was hiring a variety of lobbying groups to bolster its public image in the US. Clearly, the Gulf cares about its reputation abroad, especially when the region’s governments see what they feel to be negative coverage. On his Facebook account, political commentator (and Sharjah royal family member) Sultan Al-Qassemi gave his take on the article in the Gulf news with a list of suggestions to improve the Gulf’s image abroad. I’d make it even simpler. 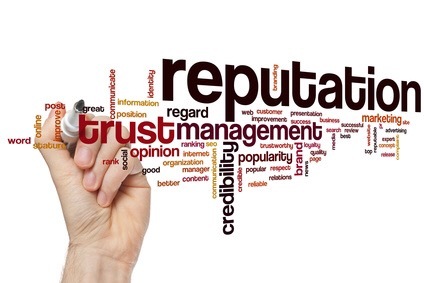 As any good and ethical public relations practitioner will tell you, your actions speak louder than your words. If the region is serious about tackling any negative perceptions or reputation issues abroad, then behaviour which is contradictory to accepted human norms in regions outside of the Gulf (read the West) must be tackled, and free(r) access should be given to the media. With social media and the internet, it is so much harder to hide anything or to spin information or events. Take for example the leaking of documents from Saudi’s Foreign Ministry recently. The best way to been seen in a positive light is not more seminars or meetings in European capitals with research centers. Instead, one must behave in a positive light, followed by encouraging the media, both local and international, to report without bias. While I’ve been in this region long enough to know better, I am still an optimist at heart. And I still believe we are capable of change for the better, as this region is magical in so many ways. However, a word of note. If my face turns shades of blue or purple, do please remind me to breathe.